There is something so soothing about a mason jar night light. After I made these gnome jars, I put them on the dresser in our bedroom, and I just love to watch the flickering light. It swear it helps me fall asleep faster. After we made our Light Up Mason Jar Aquariums, my kids and I have loved making other mason jar night lights for their rooms. 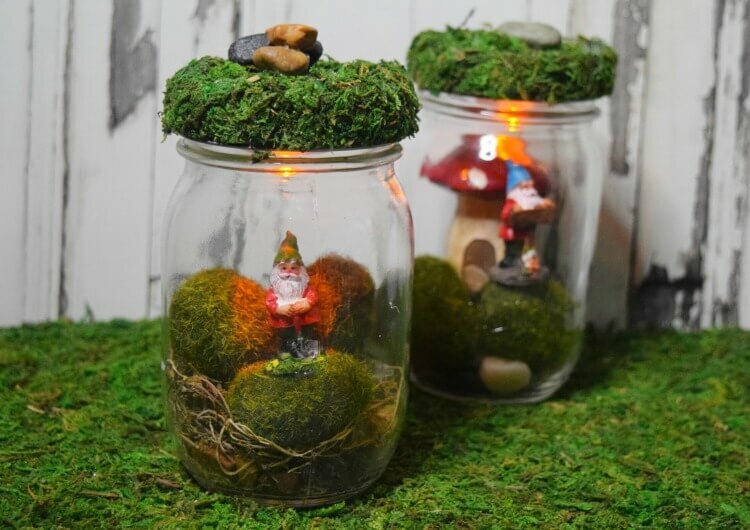 These Light Up Gnome Mason Jars are some of my favorites. 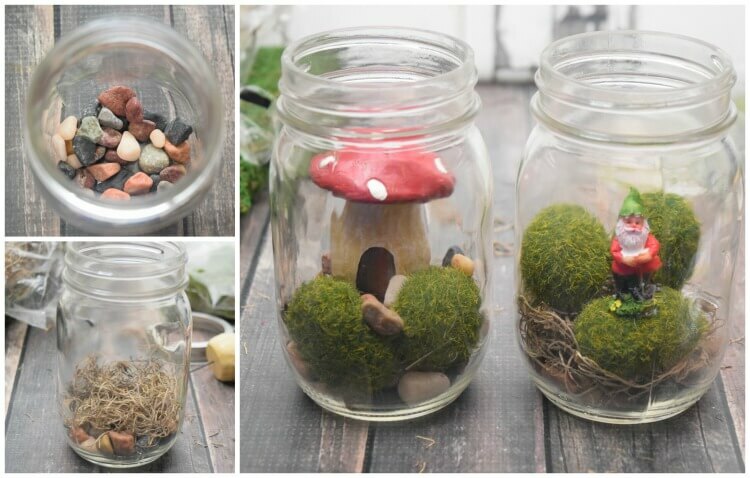 When I saw the little tiny gnomes for fairy gardens, I just knew we needed to capture a few and make some mason jars. If you’re having a fairy or gnome party, a dozen of these would be so fun to the light the path. You’ll probably notice the wire cutters front and center in the photo above. 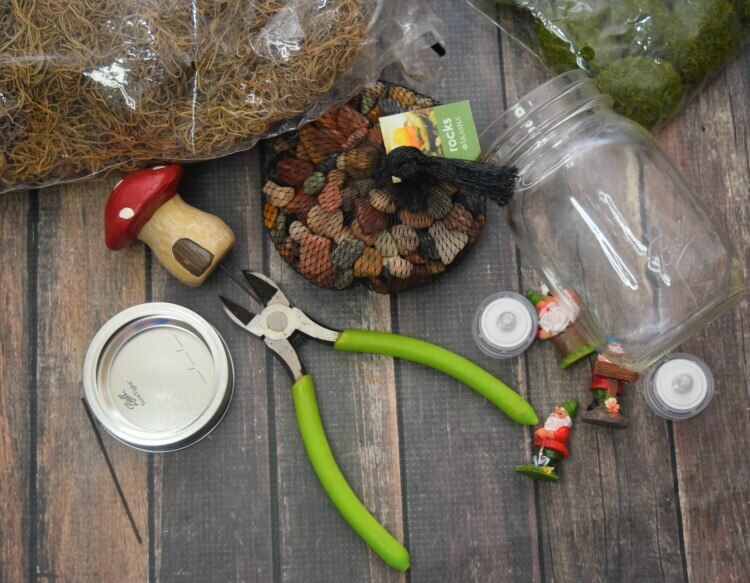 I actually had some fairy garden picks, like the mushroom house that needed to be cut down to fit into the mason jar. 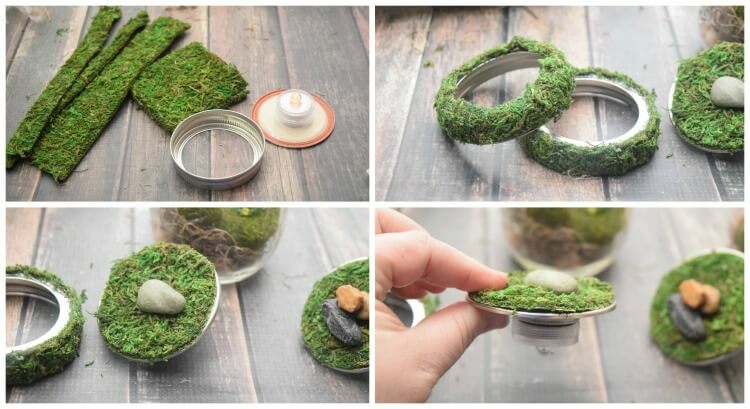 I had these faux moss rocks that are actually styrofoam, so I left about an inch of the wire from the pick and fit down nicely into the rock to place it inside the mason jar. It worked out perfectly. I linked all the supplies to Amazon up above, but surprisingly, Dollar Tree has several of these supplies for just $1, if you have one nearby. The rocks, the gnomes, and even a mason jar are just $1 there. However….these lights pictures above are definitely available on Amazon. In fact, you can find all kinds of colored ones. I chose flickering ones because I wanted it to appear like I captured gnomes and put candles in the mason jars just for a vintage-type look. These lights flicker yellow/orange in color. Be careful because if you search “submersible flickering LED lights” on Amazon you will get a ton of listings where people actually put “not flickering,” and that can easily be overlooked. 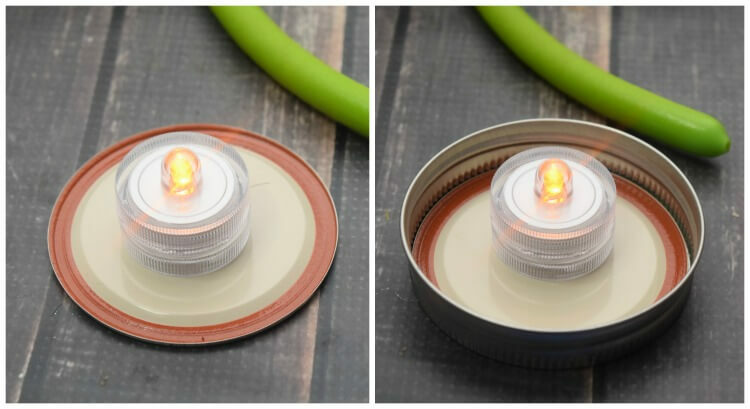 Even though there is no water involved in these mason jars, I chose submersible because you can hot glue these lights to the inside lid of the mason jar and just twist the light easily to turn it on or off. You can also unscrew the light and replace the batteries. We found theses lights will last an entire week if you leave them on constantly. First, I layered the jar with small pebbles as a base. Next, I added a layer of Spanish moss. 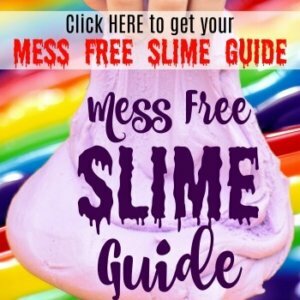 You will need way less than you thihnk, like a pinch of the stuff. Otherwise, the moss just goes too high up in the jar. Then, prepare the moss covered rocks. I found 3 rocks fit comfortable in a pint-size mason jar. I glued rocks here and there to a couple of the moss rocks, and hot glued some accessories like a tiny shovel. 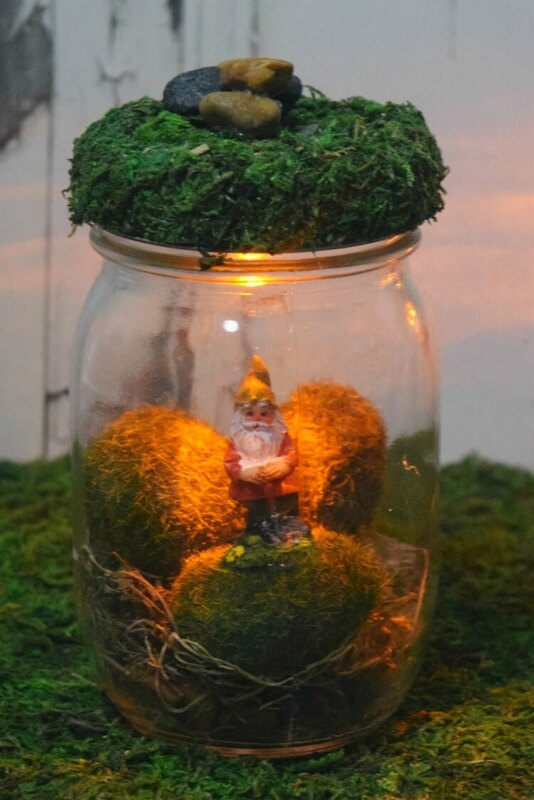 I inserted a mushroom house pick and hot glued it in place into another, and then I hot glued each gnome so he was pretty center to all the activity going on in his jar. Open your moss sheet over some newspaper or a big cutting sheet. It will shed like crazy. It should have a paper covering the sticky adhesive back. Cut a long strip that’s about 1 inch wide to wrap around the edge of the lid. When you’re ready, pull the backing off the adhesive and wrap the strip around the edge of the lid. Line one edge of the strip to the bottom edge of the lid. The top edge should rise up a few millimeters above the top of the lid so that you can push it down and hide the rest of the lid. Cut a square and then round it into a circle to place over the center part of the lid. Then stick it to the top and smooth it out. Hot glue a few small pebbles to the top of the lid. 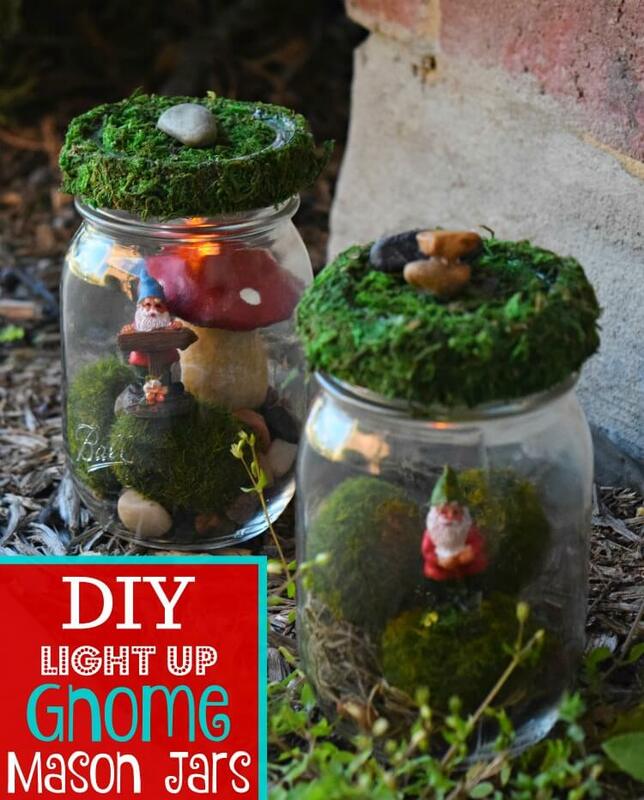 Lastly, turn the lights on and screw the lids closed for a lovely DIY Light Up Gnome Mason Jar. Need more fun crafty ideas?